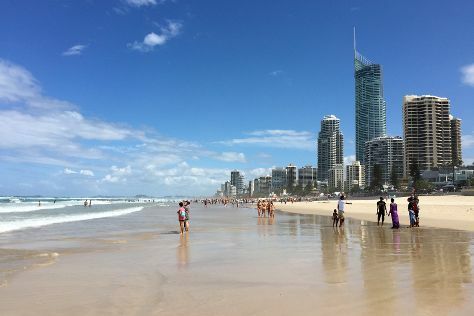 You'll visit kid-friendly attractions like Surfers Paradise Beach and Burleigh Heads Beach. Spend the 2nd (Sun) exploring the fascinating underwater world at Sea World Theme Park. The adventure continues: get in on the family fun at Warner Bros. Movie World, enjoy the sand and surf at Kurrawa Beach, enjoy breathtaking views from SkyPoint Observation Deck, and stroll through Coolangatta Beach. For traveler tips, photos, maps, and other tourist information, go to the Gold Coast trip planner . Johor Bahru, Malaysia to Gold Coast is an approximately 12-hour combination of bus and flight. Due to the time zone difference, you'll lose 2 hours traveling from Johor Bahru to Gold Coast. Traveling from Johor Bahru in June, things will get cooler in Gold Coast: highs are around 24°C and lows about 13°C. On the 7th (Fri), wrap the sightseeing up by early afternoon so you can travel back home.